Text extracts taken from the forthcoming book ‘Queen Live: A Concert Documentary’ (radically revised version) by Greg Brooks & Gary Taylor. The Freddie Mercury Tribute Concert was conceived on the night that Freddie lost his fight for life, on Sunday November 24, 1991. The three remaining members of Queen assembled at Roger’s house in Surrey, and after long discussion eventually decided to organise a tribute to their colleague. They didn't know quite what form it would take, but they did know it would be big and grand and on an appropriate scale befitting Freddie; no more than he deserved. Then a wish list of artists was slowly complied and the hard work of putting together the largest and most diverse bill of performers since Live Aid, began in earnest. The event would prove to be a logistical mountain to climb, but climb it they did, as slowly and surely the multitude of elements came together. Roger formally announced the event three weeks later at the Brit Awards ceremony on February 12, after he and Brian collected an award on Queen’s behalf for their Outstanding Contribution To Music. The award was presented to Queen in fond memory of Freddie, and Roger and Brian received a standing ovation. Rehearsals commenced in mid-March 1992 at Nomis Studios near Shepherds Bush in London. Roger, John and Brian spent the first week sifting through and playing material, deciding which tracks to perform themselves and which to offer to the other acts on the bill. Then, when the set-list was established, the other performers attended to rehearse alongside Queen, with each arrival at Shepherds Bush eagerly observed by the world’s press. As April 20th loomed closer, rehearsals moved to Bray Studios near Windsor, where the significantly larger sound stage provided a more realistic simulation of Wembley Stadium. All rehearsal footage here was filmed by the Austrian partnership known as DoRo, as well as individual interviews with each singer and musician that took part in the show. Roger (in a letter to the fans at the time): We see the concert as primarily a tribute to our friend and colleague, but also as a way of using the tragedy of his death to good effect, in bringing an awareness of the fact that AIDS AFFECTS ALL of us, to a wider range of people - by using a wide and weighty spectrum of the very best in serious contemporary popular music. This is such an important message, especially for the younger people of the world - and especially - NOW! If Freddie can posthumously help that awareness, it will be a major addition to the already wonderful achievements of his life. Following final sound checks at Wembley on Sunday April 19, the concert took place at Wembley Stadium in London on Monday April 20, 1992. 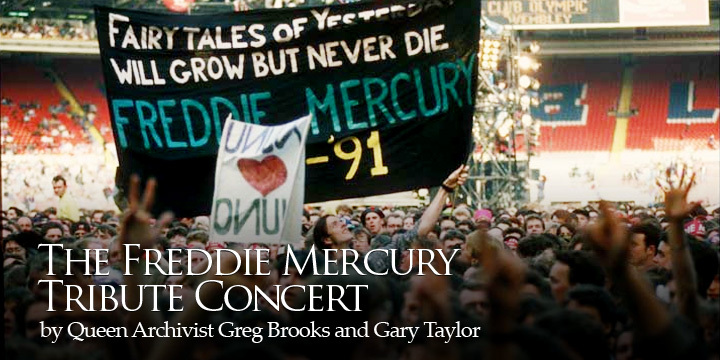 Queen were backed throughout the show by a host of trusted musician friends including Spike Edney, Mike Moran, Joshua Macrae, Chris Thompson, Maggie Ryder, Miriam Stockley, John Jones and The London Community Gospel Choir. The show was coordinated from the London based Queen Offices with Gerry Stickells and promoter Harvey Goldsmith conducted meetings with television and radio representatives, lighting and sound technicians, merchandising personnel, stage hands, crew members and roadies. Roger, Brian and John were present at many of the meetings and were involved in every stage of the arrangements, especially those relating to the artists who would appear, all of whom they selected themselves. Without exception, every artist approached by Queen, accepted their invitation to perform. The concert was directed by David Mallet and produced for television by Tony Eaton and broadcast live on Radio 1 and BBC2 TV, beginning at 5:55pm, as well as television and radio to 76 countries around the world, from far afield as the USA and Russia, with all proceeds, then and now, going to the Mercury Phoenix Trust, a newly established charity whose charter is the relief of suffering from AIDS and its related illnesses throughout the world. The Wembley stage is a massive 370 feet wide and 90 feet deep, flanked by scaffolding towers over 80 feet tall, and crowned at the centre of the proscenium arch by a giant Phoenix - a symbol adapted from Queen's crest logo, and now the emblem of the Mercury Phoenix Trust. The entire concert is projected onto two giant screens on either side of the stage. The lighting rig is bigger than anything seen before on a Queen stage, set in 15 blocks, each able to move independently in numerous directions at various points throughout the show, with many additional lights around the stage, scaffolding and stadium. When Roger, Brian and John walk out on stage to commence the show, they are greeted by a deafening roar. Brian’s first words are largely obscured by the din, but he continues anyway: “Good evening Wembley - and the world. We are here today to celebrate the life and work and dreams, of one Freddie Mercury. We’re gonna give him the biggest send off in history!” Brian then made way for Roger. When Freddie himself suddenly appears mid-way through the show on the huge 20 by 30 ft video screens, addressing a concert audience from yesteryear, there is a stunned silence. “Are you ready?” he asks, as large as life and as if he’d never gone away. “YEEEEEEAH!” the masses respond. “Huh, are you ready brothers and sisters?” he asks again, courtesy of a recording of his voice from the mighty 1982 Milton Keynes Bowl concert. No one had expected Freddie to be present at his own tribute, but of course the great man loved the biggest possible audience and this was Queen’s largest ever - how could he possibly miss that! When tickets finally go on sale, all 72,000 tickets sell out in just two hours, even though no performers have yet been announced; only the remaining members of Queen. The concert begins with short sets from bands who were influenced by the music of Queen, including Metallica, Extreme, Def Leppard (who invite Brian May onstage for a version of 'Now I'm Here'), and Guns N' Roses. There are also appearances from Bob Geldof, Spinal Tap, U2 via satellite, and a speech by Elizabeth Taylor that is momentarily interrupted by a disgruntled fan anxious for the music to continue. Between performances, several video clip inserts honouring Freddie are shown on screens in the Stadium, while roadies frantically change the stage for the next act. The second half of the concert features the three remaining Queen members alongside guest singers and guitarists, including Elton John, Roger Daltrey, Tony Iommi from Black Sabbath, David Bowie, Mick Ronson, James Hetfield from Metallica, Ian Hunter from Mott The Hoople, George Michael, Zucchero, Seal, Paul Young, Annie Lennox, Lisa Stansfield, Robert Plant, Joe Elliott and Phil Collen from Def Leppard, Axl Rose and Slash from Guns N' Roses, and Liza Minnelli. Brian: "It was a huge task to put it together, the tribute show, but very interesting, and very stimulating, all these great people coming in to sing. Some of whom were our heroes, and Freddie's heroes and some of whom regarded us as heroes." On a technical level, 1,000 people were involved in producing the show. There were 5,000 stage lights, 30 tons of scaffolding, 175 microphones, 400 miles of cable, 13 satellite link-ups (including the first ever such link to South Africa). A record breaking £600,000 worth of merchandising material was sold: £50,000 in souvenir programs, £100,000 in T-shirts, £50,000 in badges, £40,000 in baseball caps and £40,000 in posters. Furthermore, 5,000 cans of beer and 2,000 bottles of wine were laid on by the Hard Rock Café for the performing artists, while the audience drank and ate their way through 26,000 pints of lager, 64,000 Cokes, 20,000 burgers, 15,000 hot dogs, a quarter of a ton of chips and 3,000 boxes of popcorn. 100,000 red ribbons and 40,000 red scarves were given away free at the turnstiles on the day, as a symbol of Aids awareness. Ultimately £12 million is raised for Aids research. With many close friends of the band, colleagues and the world’s greatest musical artists rushing to help with this unparalleled venture (and offering their services for free), The Freddie Mercury Tribute Concert went on to be a huge success. It was watched by an audience of millions and became one of the biggest, most memorable and talked about events in rock history. And, of course, it gave Freddie the magnificent, and some might say ‘completely over the top’ send off, it was intended to! Click here to buy 'The Freddie Mercury Tribute Concert: The Definitive Edition on Blu-Ray and DVD.